We consider our modern diet to be healthy and natural, but it includes modern farmed foods including wheat, grains, dairy, legumes, soya and maize which are not a traditionally natural part of our diet. In order to prevent growing populations from starving, intensive farming developed hardy crops that were cheap and plentiful to feed the masses. Less consideration was given to the suitability of those foods to our delicate digestive systems. Your body produces a different enzyme depending on whether it is trying to digest proteins or carbohydrates. We have only been eating a modern diet of complex mixed food groups for around 10,000 years and that is why so many people struggle to digest their meals properly, they are eating foods they are not designed to eat in combinations that their stomachs can’t deal with. The enzymes necessary to digest proteins and carbohydrates don’t work together very well, so when you eat combined foods you create two enzymes that can’t digest everything you have eaten. The Paleolithic diet requires avoidance of modern foods that are not easy to digest including; wheat, potatoes, grains, legumes, refines salts, dairy, refined sugars and refined oils. These foods are alien to us and we can’t easily digest them, the refined foods are usually converted into body fat as our body can’t do much else with them. You should avoid anything that has been processed in any way and only eat nature, organic foods. 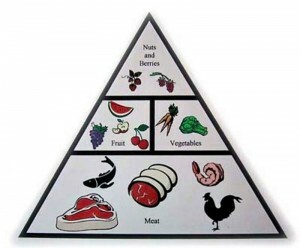 What Can I Eat on a Paleolithic Diet? The diet of a hunter-gatherer or caveman was a simple organic diet of foods that were naturally available to them, including; meat (organic naturally), fish, fruit, fungi, eggs, roots, nuts and vegetables. Hunter-gatherers would eat these foods as they found them rather than mixing them together as we do today. By combining these foods correctly you can still eat great tasting meals but meals that are easy to digest and gain the maximum nutrition from.